This is a very easy but delicious favorite Low Carb Chicken Breast Recipe, not only for carb counters but for anyone. This is a low carb plate often requested by restaurant guests who are either "counting carbs or calories." It is very simple, but they never seem to grow tired of it. 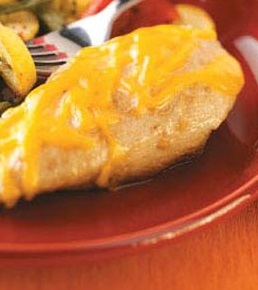 This recipe is for a very basic low carb plate using boneless, skinless chicken breasts. But you can substitute a 6 ounce lean hamburger patty and you'll still only have about 17 grams of carbs for the entire meal. You can also substitute your favorite cheese instead of using cheddar, if you wish. For the taste and nutrition you really want, use quality products. Enjoy your low carb chicken recipe and the company of those you share it with!